. The striking miners have rejected a deal to return to work on Tuesday, due to their demand for higher pay. Police report says the workers had earlier torched an electricity sub-station and had set up barricades. According to striking worker MacDonald Motsaathebe they earn peanuts and ever since they have been having running clashes with groups of about 1,000 people who formed a barricade to prevent police from entering the site. Amplats said in its strike arrangement it would give the workers a one-off “hardship allowance” of $230 (£140), as part of a deal struck with trade unions, including the National Union of Mineworkers (NUM). However, striking worker MacDonald Motsaathebe told Reuter’s news agency that workers would not resume work until their wage demands are met up. The workers have been demanding $1,840 in monthly pay, which is more than three times their current average salary. Analysis says that workers across the industry are disaffected with the NUM and other ordinary unions, who look at them as being too close to the employers and government. The income levels between South Africa’s workers and employers are among those not the same in the world. Earlier this month, President Jacob Zuma called on company bosses to take a salary freeze. 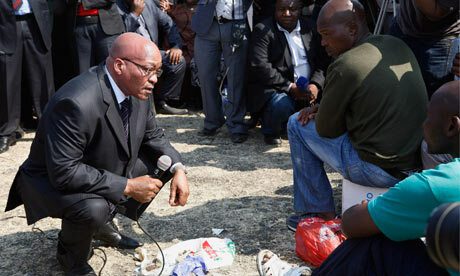 South Africa’s mining sector has been hit by a wave of recent unrest which has left almost 50 people dead. In August they have been clashes between police and striking workers at the Lonmin-owned Marikana platinum mine near Rustenburg, 120km (70 miles) north-west of Johannesburg. The latest clashes took place at a mine owned in the same area by the world’s biggest platinum producer, Anglo American Platinum (Amplats). Over the weekend, Amplats had agreed to re-establish 12,000 miners dismissed for taking part in a six-week-long illegal strike. The recent unrest in South Africa is one of the worlds biggest and has badly hit the country’s economy, with the rand losing value and its credit rating downgraded. Most of the strikes have been over wages payment.